This is the original Applegate-Fairbairn folder offered by Gerber. Thumb stud for easy one handed opening Sturdy liner lock keeps blade locked securely in place Ballistic nylon sheath is designed to be worn in either a vertical or horizontal position Full stainless steel liners. This large Combat folder is the collaborative effort of Colonel Rex Applegate, Bill Harsey and Butch Vallotin. This large folder was designed for military and police type applications. It is sturdily constructed with full stainless steel liners and a sturdy liner lock mechanism. A tough ballistic nylon sheath comes with the knife and is designed to allow carry in either an up and down position or a sideways position. 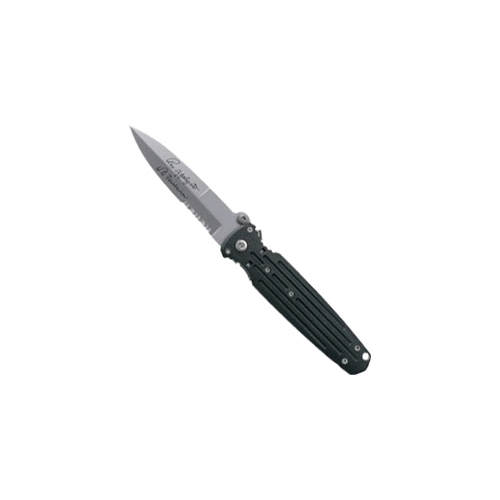 A right / left thumb stud system make this knife highly functional for right or left handers.